Looking to bounce back from a rough opening week, the San Diego Rebellion will host the new and improved Los Angeles Bobcats, who are fresh off a hard-fought victory. While these teams faced off during a preseason scrimmage last year, this will be their first-ever meeting in an official game. The second matchup of this series is scheduled for May 18th in Los Angeles. Breakdown: A great first half effort was led by Knengi Martin, who accounted for both Rebellion touchdowns as a passer and runner. 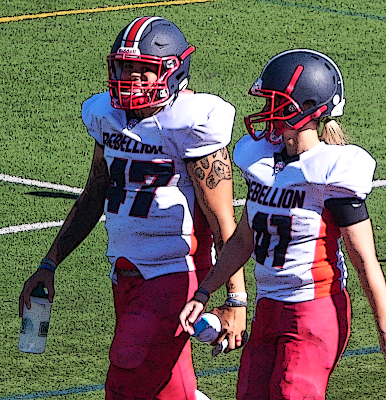 Her top targets were Lanika Manning (3 catches for 33 yards) and Kristin Smereczynski (11-yard TD catch). Martin also led the team in rushing with 111 yards on 13 carries, while Katie Ott recorded an interception on defense. Breakdown: Redd Brinkman's 75-yard touchdown pass to Olivia Morgan proved to be the game-clincher as the Bobcats stunned the Seattle Majestics, earning their first win since 2017. Living up to her nickname, linebacker Angela "Havok" Mims contributed to LA's outstanding defensive performance by putting up 3.5 sacks, 4 tackles for loss, and a forced fumble.